According to a recent report on Rukkus.com, slightly less than 1 percent (128 to be exact) of Division I’s 13,738 college football players hail from Kansas. While this may seem like a drop in the bucket, the Sunflower state claims more FBS players than such states as Iowa and Arkansas and isn’t far behind the likes of Wisconsin, Colorado, Missouri, New York and Oklahoma. The impact the Kansas natives are having is significant. In addition to the rosters of Kansas and Kansas State being littered with players from their home state, Kansas products are playing integral roles at other big-time college programs. Olathe South alum Braden Smith returns as a starting offensive lineman for Auburn, while Derby’s DeAndre Goolsby is a starting tight end for the Florida Gators and Bonner Springs High’s Tyler Howell is the starting left tackle for the Missouri Tigers. Those examples only scratch the surface, and the state’s impact on Division I college football should do nothing but grow. Before the season even started, 13 Kansas high school recruits had already verbally committed with D-I colleges. The 6-foot-5, 250-pound tight end and defensive end for Class 5A’s Purple Dragons verbally committed to Northwestern in March. According to ESPN.com, Kent rates as a three-star recruit with an overall grade of 79. He is listed as the top recruit in Kansas and 91st in the region. Others schools who were reported to offer included Michigan, Nebraska, Penn State, Missouri, Kansas, Kansas State and Iowa State. Kent has helped the Dragons to a 1-1 record as Pittsburg crushed former Southeast Kansas League rival Chanute 44-0 on Friday. He will certainly be tested during his senior season as Pittsburg’s move out of the SEK allows it to play such Missouri powerhouses as Harrisonville, Webb City and Carl Junction. Hubert, who gave a verbal to Kansas State in February, offers another big frame at 6-3 and 250-plus pounds. Like Kent, the T-Birds’ senior is a three-star recruit according to ESPN. He received a grade of 78 and ranks as the 58th player in the nation at his position. As a junior, Hubert recorded 90 tackles, including 24.5 for loss and 11 sacks. He was named to the Kpreps.com Class 5A All-State team. The T-Birds opened the season with a 1-1 record after Friday’s 40-0 win over Topeka West. Hubert, who also plays tight end, caught three passes for 85 yards and a touchdown. He also registered two sacks. The imposing 6-6, 330-pound Rivas made his intentions to play for the Kansas State Wildcats known in June. According to ESPN, he chose K-State over such schools as Arkansas, Missouri, Virginia Tech, Purdue, Kansas and Memphis. ESPN rates Rivas as a three-star recruit with an overall grade of 78. Rivas earned Kpreps.com Class 6A All-State honors last year. The 6-5, 270-pound defensive lineman confirmed his intent to play college football for Iowa State in April. According to ESPN, he passed up offers from Oklahoma State and Northern Illinois. Unfortunately, Dominguez suffered a season-ending knee injury in fall camp. His Saints are off to a 2-0 start and are ranked in Class 5A. As a junior, Dominguez posted 42 tackles, including 11.5 for loss and five sacks. He was named to the Kpreps.com Class 5A All-State squad. ESPN gives Dominguez and overall grade of 77 and considers him a three-star recruit. According to ESPN, Armstrong gave his verbal commitment to the Missouri Tigers in June, choosing the SEC school over Illinois, Northern Illinois and Wyoming. In two games this season, Armstrong has 10 catches for 249 yards and a touchdown. He also has one rushing touchdown. Armstrong, who is 6-1 and 190 pounds, recorded 65 receptions for 1,262 yards and 15 touchdowns as a junior. He earned Kpreps.com Class 4A Division I All-State recognition. ESPN considers Armstrong a three-star recruit with an overall grade of 76. The 6-6, 260-pound lineman verbally committed to Kansas State in June. Joining Rivas, Trinity’s Ben Adler and Ulysses High’s Harrison Creed, Mills is one of four offensive linemen from Kansas to commit to the Wildcats this offseason. The Railers hope players like Mills can help them improve on last year’s 1-8 record. Mills is a three-star recruit with an overall grade of 76, according to ESPN. The 6-4, 210-pound receiver, who runs the 40-yard dash in 4.67 seconds, chose in August to join the Kansas Jayhawks’ “air-raid” offense. Tabor caught 45 passes for 750 yards and eight touchdowns during Derby’s Class 6A championship run in 2015. He had three receptions for 54 yards and two touchdowns during the Panthers’ 35-6 win over Goddard on Friday. With an overall grade of 75, ESPN considers Tabor a three-star recruit. He chose the Jayhawks over Kansas State. 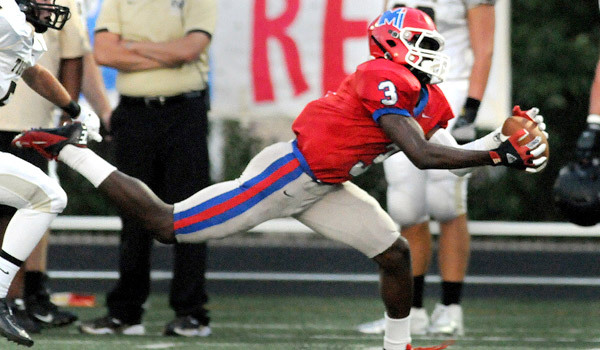 Colbert transferred to Bishop Miege from Winnetonka (Mo.) after his junior season. At the next level, the speedster chose Iowa over the likes of Nebraska and Kansas, according to ESPN. Scout.com says the 6-1, 180 Colbert boasts the ability to play on an island. Colbert’s Stags (1-1) are ranked first in Class 4A Division I after a close loss to 6A’s Blue Valley and a lopsided win over Gardner-Edgerton. ESPN considers Colbert a three-star recruit with an overall grade of 70. The offensive lineman gave his verbal commitment to the Kansas Jayhawks in June. Behind Gibertson and others on the Wichita Northwest offensive line, the Grizzlies have displayed an explosive attack. The Class 6A school scored 61 points in a season-opening win against Bishop Carroll. Gilbertson is listed at 6-3 and 280 pounds. The Free State linebacker committed to the Kansas Jayhawks in May. Dineen forced a fumble during the Firebirds’ 38-0 victory over Shawnee Mission South on Friday. He recorded 83 tackles for Free State as a junior. He is the younger brother of Joe Dineen, who is a starting linebacker for the Jayhawks. Joe Dineen posted 86 tackles for KU last year. The 6-5, 300-pounder stands out in Class 3A. Adler committed to the Kansas State Wildcats in June. He helped the Knights to a 6-3 record last year and has been a force on both sides of the line. Creed completes the list of 2017 Kansas products who have verbally committed with the Kansas State Wildcats. The 6-6, 320-pounder committed to K-State in June. He’s helped Ulysses to a 1-1 start this season and an 8-2 record last year. Despite little high school experience at quarterback, Wheeler’s strong arm and quick release was impressive enough over the summer to land an offer from Kansas State. The 6-foot-4, 200-pound quarterback prospect was happy to commit to the school where his dad and uncles played. In two starts this season, Wheeler has completed 22 of 49 passes for 229 yards, two touchdowns, and three interceptions. He has also rushed for 83 yards on 27 attempts. While 13 players from Kansas are known to verbally commit to a D-I college so far, the list is expected to grow. Other state products with Division I interest include Newton running back Kade Remsberg, Derby wide receiver Kai Lemons, Wichita South athlete Tyrekus Birch, Bishop Miege offensive lineman Colin Grunhard, Mill Valley lineman Keegan Zars, Wichita Northwest running back Jahlyl Rounds, Wichita Collegiate linebacker Cooper Root, Blue Valley lineman Kirrian Kirby, and Junction City back Jovon Baldwin.